Antique (circa 1900) Scroll back, button back armchair. 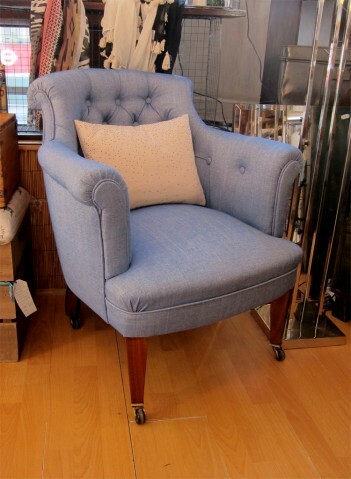 Newly re-upholstered in the lovely blue fabric (Jane Churchill Brisley Indigo), new springs and traditional stuffing. New fire retardent fabric, legs repolished, wood frame. Please click on the photos to see larger and alternative photos including before and after re-upholstering.